It was, Nhaqosa had decided, the stares that got to him the most. Each village, each town, each tiny settlement they had passed through, it was always the same; always the stares. Blacksmiths laid aside hammers to come take a look, farmers tightened their grip on scythes and pitchforks, merchants shut up shop, while children hid behind their parents and the common folk fled. Some were merely curious, many were hostile, but all, regardless of intent, openly stared at him. His hand twitched involuntarily to the wolf’s head pendant that hung around his neck, a simple pendant carved out of red wood that nestled against this white furred hide. It may have been simple it appearance, but it called to him, beckoning him to follow. Only the faintest trace existed, barely a tingle that sparked across his fingers as he touched it, but it existed, a strange urge that drew him on; a lifeline that pointed the way home. That path lay far away though, along a road that had already led through many villages and towns upon that alien world, and would undoubtedly lead through many such more before the journey at last reached its end. A world in which neither the wolf nor the dog existed. He shifted his vast weight on cloven hooves, resting his hands on the handle of the heavy stone-headed maul that had been propped upon the barren earth in the midst of the village square they had found themselves in. A small gathering had started to congregate, and once more there came the inevitable stares. He returned them in kind, while his ears twitched and tail lashed behind him. For those that knew him well, despite a face that might as well have been an expressionless mask reflecting no obvious emotions, they were a sure sign of his growing irritation. Oh, he new the reasons behind the stares and the looks. He was as alien to this world as it was to him. His likes had never been seen there before, never set foot on this world, and like as not, never would again. 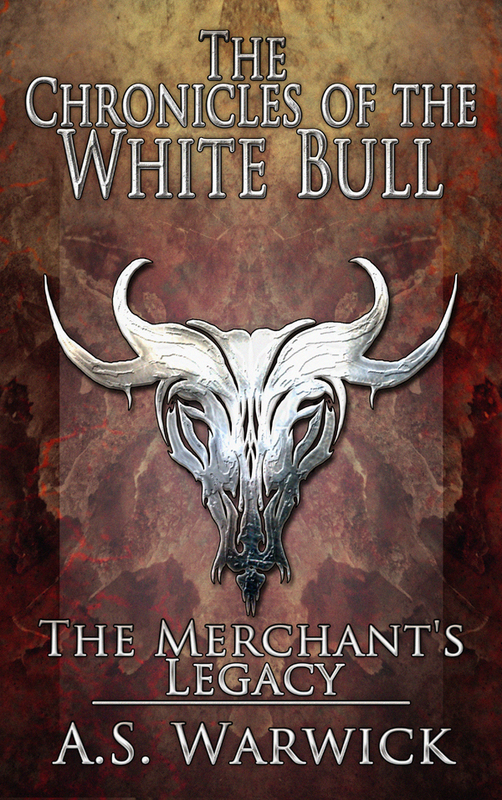 A giant, bull headed man, his hide gleamed white in the brilliant sunlight, while sweeping razor sharp horns crowned his broad head. In a world beset by monsters, the suspicions were understandable. Being brutally honest with himself, he knew that if the situation were reversed, he would do the same, yet that did not in any way lessen the irritation that he felt from the stares. A tough looking man, skin weathered by the elements, dark eyed and narrow of face, walked across the square from the gathering of villagers. A sword in a battered scabbard hung over his back and he wore a jacket of dark leather into which metal studs had been set. “Kwaza,” he said respectfully upon reaching Nhaqosa. The man, Abasan by name, had once been a gladiator slave who had fought alongside Nhaqosa, first in the fighting pits and then in the bloody revolt that had won their freedom, a revolt provoked by a knight by the name of Elad. Ever since, Abasan and around two dozen of his fellow escaped slaves and gladiators had followed Nhaqosa as they traversed the brutalised world. Out of all those he had come across, only they no longer stared at him, seeing him as one of them and not a monster, for which Nhaqosa remained ever thankful. They didn’t stare, but something else lurked in the way they looked at him, a look that could be just as profoundly unsettling in some ways. Respect he could handle, but this went beyond that, a devotion that he did not merit. “Do they know anything?” Nhaqosa asked, his voice a sonorous rumble. “I was speaking to her recently,” Abasan noted, becoming all serious in expression and tone. “We will find a way,” Abasan told him, loyal to a fault. “She is not the only one,” Nhaqosa pointed out. The gaze which Nhaqosa fixed on Abasan was, at once, both puzzled and thoughtful. The man’s statement had been a curious one, coming as it did out of nowhere. “In fire?” he asked. Nhaqosa’s brow furrowed and he appeared on the verge of replying, yet before he could, Niati walked over to join the pair of them, the man and the minotaur. Nhaqosa had always thought of her as a girl-child, for, compared to the others, and especially compared to himself, she was a small and slender thing. Even though in the fighting pits she had more than proved herself, and in doing so had become something of a crowd favourite, it was a notion that he could not shake. Dark of skin and hair and eye, her striking looks and exceptional, lithe grace had made her stand out within the pits. The fights, though, had to some degree marred her beauty, leaving their marks upon her face, yet such was her exoticness that she could still attract attention almost as readily as he did. She seldom spoke of her past, though Nhaqosa had been able to piece together fragments from the few comments she let slip and from rumours that swirled around her, fitting together at least some of the puzzle. She had been a court dancer once, for one of the Muatra princes who dwelt in the far south, chosen at a young age for the role due to both her looks and skill. The exact reason for her fall form grace was one she never spoke of, and one Nhaqosa had been unable to discover, but it had been the result of some form of court intrigue that had seen her family disgraced and sold to the fighting pits, condemned to die. Out of all her family, only she still lived, her training as a court dancer having stood her in good stead. The scars to her face had not been the only ones the gladiatorial contests had left on her. There were those that she carried within. “Kwaza,” she greeted Nhaqosa rather formally, her face serious. She always had that look, for she seldom laughed any more, or even smiled. “I could still take you,” Abasan replied, his narrow face split by a broad grin. ` “My apologies, Kwaza,” Niati replied, her tone one of contriteness, yet even still Nhaqosa sensed something else lurked in it, something he could not fathom, much like the girl herself. No matter how hard he tried, he could not figure her out fully. While independent, and fiercely so, she still followed his commands without hesitation, though not with the near blind obedience of Abasan. Her reactions to him were completely at odds with how she saw and treated the others. The announcement brought a number of cheers and jeers, in equal measure, and the exchange of coins between various parties. Nhaqosa smiled to himself at the exchanges; oft times they would bet on near anything for entertainment or to relieve boredom. Shouldering packs and a motley assortment of weapons, the escaped gladiators and slaves who made up Nhaqosa’s band began to depart the village. Horses were far too rare, and far too expensive for their means, and so they walked wherever they went, a journey that had so far traversed many weeks and long miles through a broken, dying land. They were a grim, foreboding looking lot, scarred by battle and hard of face, drawn from all the mix of nations and peoples that had formed the Old Empire, with skin from the darkest black to the palest white and all the shades that lay in between. Niati was not the only woman in the band either. They had, those two dozen survivors, become Nhaqosa’s family in a world not his own, like brothers and sisters, sons and daughters to him. Upon their escape alongside Elad they had numbered more, but eight had already fallen, eight members of his family. The world that lay beyond the fighting pits was just as hard, and even more treacherous, and to make their way as they journeyed across it they had fallen back on the old skills they had learnt in the pits. They could fight, and so they had become sell swords and mercenaries. Always, though, Nhaqosa made sure that the commissions they accepted were as just and honourable as could be found in a dishonourable, failing world. Most had tossed aside such principles, resulting in bandits infesting the lands. Those had become the ones they mostly fought, guarding merchants or defending simple villages that were preyed upon by those without honour, the base, ruthless dregs of a world. Stares from eyes that had seen much of the light extinguished from them accompanied Nhaqosa’s band on their march out of the village. Even while lending aid, bands of heavily armed warriors were seldom welcomed.